Who doesn’t love the Monopoly board game? 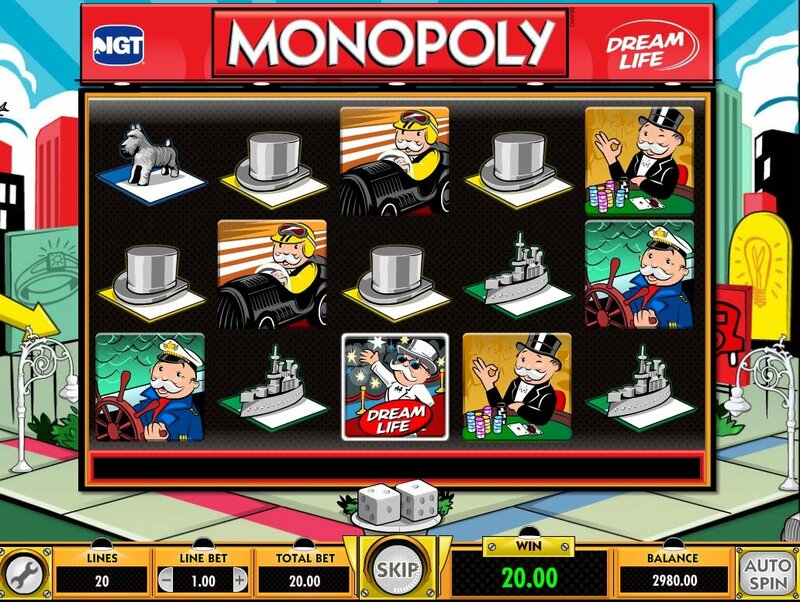 Now you can cash in that monopoly money for some real bucks with the Monopoly Dream Life online slot game. Come on now! You know Monopoly has been a classic board game for generations! Originally released by the Parker Brothers, this classic board game subtitled "The Fast-Dealing Property Trading Game" now comes as a fantastic online slot machine. Now you can play this beloved game from home as an online slot machine for real money. What’s not to love about the iconic symbols of the Monopoly game? Images on the reels spin with pictures of your favorite uncle with the white mustache, Rich Uncle Pennybags, sailing a ship, driving a race car, playing at the casino, or looking dapper in a white tux. The game also includes symbols of the game tokens including the battleship, Scottie dog, and top hat. The Bag of Money represents the Wild Symbol and can replace all icons except the Bonus symbol. All the icons animate after landing on a winning combination. Even the “Spin” button retains the Monopoly theme by representing the "GO" tile from the board game. 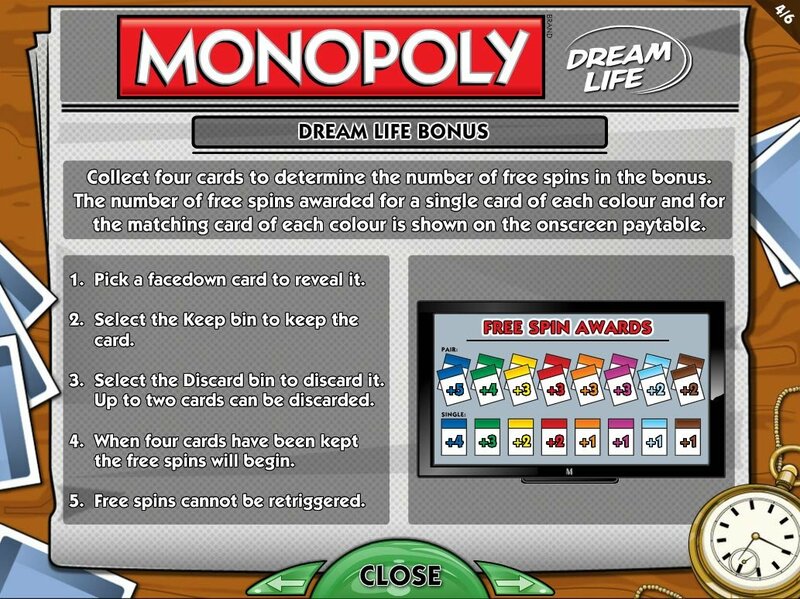 You’ll walk away rich as Uncle Pennybags with Monopoly Dream Life slot’s unique Freefall Symbols Feature… In this case, the game reevaluates new winning symbol combinations and even more money adds to the meter. 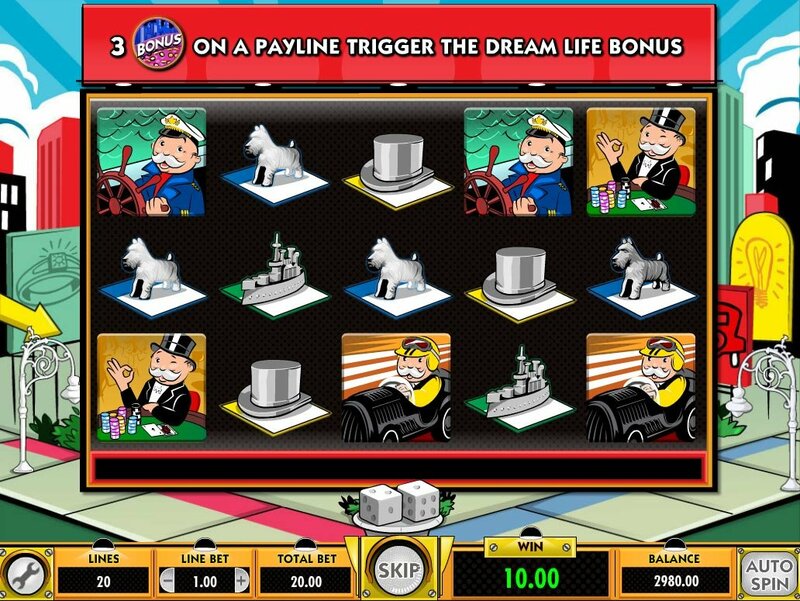 You’ll walk away as rich as Uncle Pennybags with Monopoly Dream Life slot bonus Freefall Symbols Feature. This feature causes any winning symbol combinations to disappear. Instead, the empty spaces fill from symbols cascading down from above, in sequence. In this case, the game reevaluates new winning symbol combinations and even more money adds to the meter. Cascades continue until no winning symbol combinations appear. The city skyline represents the Bonus Symbol. 3 appearing on a payline trigger the Dream Life Bonus. During this bonus round, you collect four cards to determine the number of free spins you’ll receive. When the bonus round starts, a number of different colored property cards appear, recognizable from the board game. Now you must choose a facedown card. You can choose to discard up to two cards. When four cards have been kept, the free spins will begin. Unfortunately, only the luckiest players will ever get to play this round as the bonus symbols don’t appear very often on the reels. The game also includes an Auto Spin option so you can sit back and relax while you cash in. The maximum win on any transaction including the results of the free spins, plus the outcome which launched the bonus is capped at 25,000,000.